Poznan can boast of many independent coffee shops; exploring them could be a lifelong adventure. My friend, Klaudia, has been recommending La Ruina to me, but to be perfectly honest, I was intimidated by their description on facebook: cafe, amusement park ride, movie theater. It sounded like it might be too much for a non-native to take on. 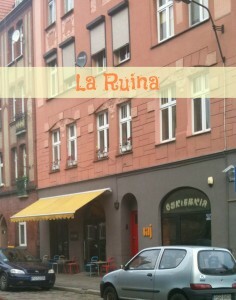 Klaudia and I hadn’t seen each other for a while, so she suggested we meet at La Ruina yesterday. Just a few yards from our frequent bike route at Śródka 3, I kept thinking how have I missed this – the place must be massive? 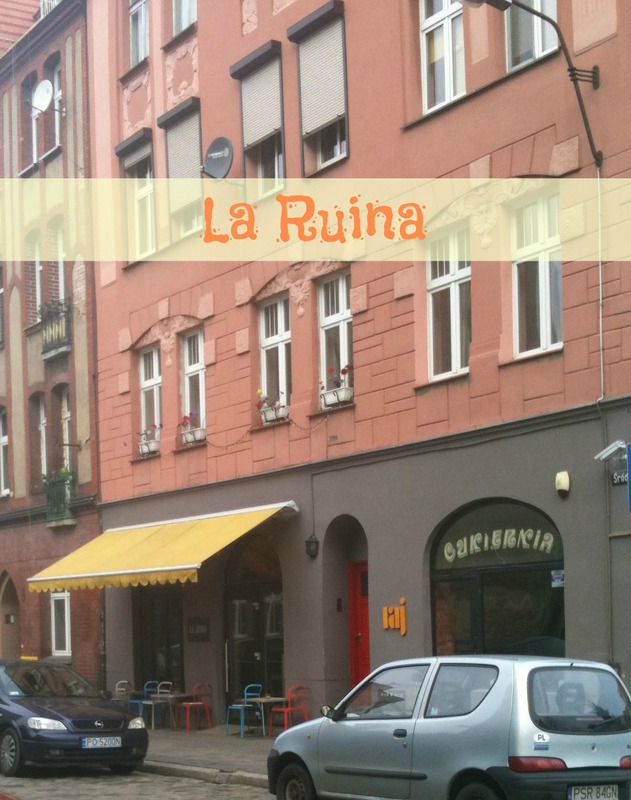 Actually, La Ruina is a typical Polish coffee shop on the ground floor of an apartment building, not intimidating at all, with cozy seating for about 20. A variety of tea and coffee drinks are available. We had a cappuccino and a cafe latte and sampled the two cakes featured that day: a flourless chocolate cake and a New York style cheesecake. The flourless cake was dense, moist and intensely chocolate. The cheese used in the cheesecake made it American, but there was something about the texture that still said Polish to me. Both were yummy. Just down the street from the cathedral, we had the shop to ourselves in the beginning, but then the place quickly filled up, and I suspect it stays they way until they close at night. Bright, clean, with English speaking staff, La Ruina is definitely foreigner friendly; I needn’t have worried. Before we left, one the owners gave us a tour of the restaurant they’re opening next door in a former bakery. The restaurant name, Raj, translates to Paradise and is taken from a film title. The menu inspired by their travels will feature Vietnamese and Thai food. In the back of the restaurant is what used to be the bakery kitchen, an old oven door remains in a tile wall. This room has been converted to a theater seating about 30 people. As for the amusement park ride, I’m not sure. Klaudia did say that they have more outdoor seating in the summer and badminton set up. If you’re in the area of Rondo Śródka, check it out. Sounds like a great place for coffee if I make it Poznan this summer! Word from eye surgeon — nothing for six months, so it is full steam ahead with planning for a summer in Poland. 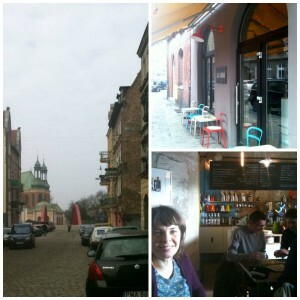 Lori – there are so many great places in Poznan, it will be difficult to choose! I’m glad to here you have doctor approval for your summer plans!